On a normal day, I typically need to tame my Vata, so coffee is a bit of a no-no for me! When I need a bit of a boost that I'm not quite getting from Golden Milk or Detox Herbal Tea, I turn to rich, satisfying chai instead. 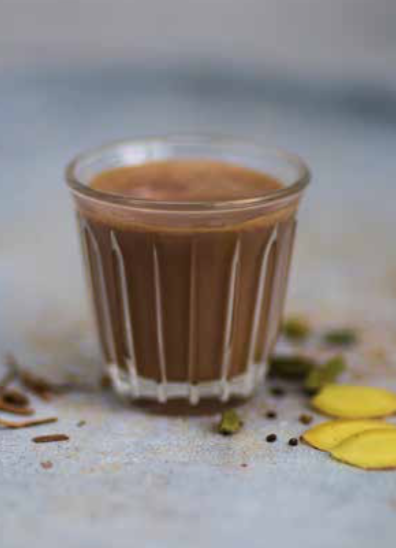 Far from the old teabag-and-a-dash-of-milk English formula, this recipe — inspired by the wonderfully welcoming Ravva family in Hyderabad — is a delicate blend and endlessly fragrant. To make some delicious variations, try adding 1⁄2 star anise, 1⁄2 teaspoon of coriander seeds or a pinch of nutmeg or allspice when you’re simmering. Place the milk in a small bronze pot or milk pan. If you are using dairy milk, add 120ml (1⁄2 cup) of water. If you are using almond milk, add 60ml (1⁄4 cup) of water. Add the remaining ingredients, apart from the ginger, cinnamon and jaggery, and gently simmer for up to 15 minutes. Add the ginger, cinnamon and jaggery and simmer for another 2—5 minutes, depending on your preferred strength of ginger. Strain and serve.